Loss of mobility is one of the most common issues affecting senior people’s quality of life. In order to continue living a functional life even after the signs of aging have started to show, it’s important to take advantage of the aids designed to make life easier by getting something such as the best bed step stool for elderly citizens you can find. After assessing the technical specifications of various products, as well as the reviews made by users and caretakers, our team came up with a list of the most popular models. The Drive Medical Heavy Duty makes the top of our list primarily due to the security features it is fitted with. Moreover, its sturdy construction makes it suitable for users up to 500 lbs and it comes fully assembled for your convenience. If this item happens to be out of stock, make sure to have a look at our second-best choice, the Drive Medical Footstool. This sturdy footstool takes security up a notch by featuring a handrail, as well as a platform fitted with rubber leg tips for extra protection against skidding. The highly-resistant 1-inch steel tubing provides superior protection due to the cross bracing structure. This enables it to sustain users weighing up to 500 lbs. In addition to this, the manufacturer puts your convenience first by shipping the item fully assembled. Some buyers reported that the stool can feel a little bit wobbly. This item puts the user’s security first, as it comes equipped with all the necessary safety features. This solid model is shipped by the distributor fully assembled, for the users’ maximum convenience. Practical for reaching top shelves and for assisting senior users, it can also be used in the bathroom to help children reach mirrors and high sinks. Safety is a top concern, as the platform is ribbed and made from rubber to avoid skidding. Moreover, the leg tips are reinforced with rubber, as well, for superior stability. According to some users, this product can be unbalanced and unstable. If you’re looking for a versatile footstool, this model can serve a variety of purposes around the house. Fitted with a wide rubber platform specially designed to prevent slipping, this stool also features wide-angled legs which provide additional safety and stability. The feet are capped with rubber tips which offer anti-skid capabilities and ensure the stool will leave no marks on the floor or on the tiles. This model is at the same time lightweight and resistant, as it’s made from steel and can sustain users up to 300 lbs. You’ll need to put this product together, as it doesn’t ship fully assembled. This will come in handy both as a mobility aid and as a stool to help you reach the top shelf. To save you the time and energy it takes to analyze each model and go through the reviews of bed step stools for elderly citizens, we did all the research work for you. After carefully examining the plethora of options available out there, our team made a selection of the top-rated products. There is a lot of inconvenience in relying on mobility aids to move around and to do the activities most of us take for granted. The Drive Medical Heavy Duty attempts to make things easier for senior citizens by proposing a model which comes fully assembled and ready to use from day one. For maximum safety, the platform is supported by a steel framework made of 1-inch steel tubes placed in a cross brace pattern. In addition to this, the leg tips are covered in rubber for superior non-skid features and the surface is designed so as to prevent slips. 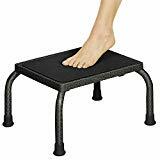 Besides providing the much-needed support for climbing into and getting out of bed, this footstool can be safely used to reach tall shelves or the top compartments of cabinets. Designed for heavy-duty use, the platform is made to support users weighing up to 500 lbs. For those of you who have small children around the house, this platform will instantly become a versatile item, as it can be used not only by seniors but also by the little ones to reach the bathroom mirror as well as high cabinets and sinks, due to the safety features it contains. Considering that it comes fully assembled, it can be used from day one and you won’t need to spend any time and energy figuring out how to put the pieces together or trying to get hold of the necessary hardware. Due to the rubber platform, your feet will stay put on the stool so that you’re safe from accidents. In addition to this, the reinforced rubber feet have great adherence to hardwood floors and tiles and the construction is made from solid steel which eliminates the risk of tripping over. Made from highly durable steel, the Vive Step Stool is resistant to corrosion and comes in a lightweight model so that it can be easily transported and carried around wherever you need it. Designed with the needs of bariatric customers in mind, it can safely support users weighing up to 300 lbs and features an angled leg structure which provides superior stability. One of the main concerns when it comes to using a step stool is the risk of slipping or skidding. To eliminate this issue, the platform is generously wide and has a rubber ribbed surface which ensures your feet make firm contact. It can be used seamlessly on any floor inside your house, be it in the bedroom, kitchen or bathroom, as long as it’s placed on a flat surface. At the same time, your floors are safe from damage due to the rubber leg tips which ensure protection against tipping. For senior citizens who have lost their mobility, living an active and fulfilling life may be a bit of a challenge. This doesn’t have to mean you should give up doing the things you love and going wherever you want. The Duro-Med DMI Step is built so as to withstand heavy-duty use and is able to help you in a variety of situations, from climbing into and out of higher beds to reaching top shelves and climbing into vehicles. For added convenience, the stool comes fitted with a handle improved with foam grip, which makes it a lot easier to maintain your balance and distribute your weight when getting up and down from it. While this model doesn’t come already assembled, putting the spare parts together is a piece of cake since the purchase includes a small wench as well as step-by-step instructions. There are many situations where a little extra help makes a huge difference in terms of everyday life convenience. Reaching an inaccessible item on a top shelf or even getting into or out of a high bed with ease can be small achievements for elderly citizens. Due to its portability features, the Ollieroo Portable Lightweight is a multifunctional item to have at home. As it can easily be folded for convenient transportation, it can serve not only as a step stool but also as a ladder, a fishing or even a gardening seat. Its practicality also comes from the fact that it weighs no more than 4 pounds, it features an easy lock design which keeps the legs folded away, and it’s equipped with a carrying handle so you can move it from one place to another just as easily as you would a suitcase. If you or someone you love is in need of a step stool, stability is most likely one of the main features you wish your ideal product had as a key strength. This goes hand in hand with resistance and durability so that you can be confident that you can count on the help of your mobility aid. All these qualities are part of the Vaunn Medical Foot’s promise to its users. The triple-layered chrome-coated steel framework ensures that this model will support heavy-duty use throughout the years while retaining its sturdiness. At the same time, the chrome coating used in its making protects it against rust for as long as you’ll be using it. Highly endorsed by medical professionals who use it in hospitals and clinics, this product can also offer professional quality as a home footstool or a step stool to help you get things off unreachable shelves. After a certain age, once our mobility stars decreasing, simple things such as climbing into a higher bed or out of it, stepping across the threshold into our own house, into the bathtub or into a car can be a hassle. Regardless of the way you intend to use it, the Jobar International JR5919 is suitable for both indoor and outdoor environments, as it comes fitted with holes for easy drainage to reduce moisture, as well as a rubber thread which helps prevent slipping. Both durable and highly resistant, this model supports up to a maximum of 440 lbs and weighs only 3.6 pounds, which makes it easy to carry around wherever it’s needed. In addition to this, its dimensions make it a perfect fit for doorways, helping you cut in half the effort of lifting your legs to step into or out of the house. Designed for bariatric use, the AW Portable Medical takes sturdiness a notch further and can be used by people weighing up to 500 lbs, which is more than most similar models can support. Despite its weight limit, it’s easy to transport wherever you need a few extra inches as it weighs no more than 5.5 lbs. In order to provide the users with stability and safety, the surface is non-slip textured and made from rubber for a better grip. Another safety feature is the fact that the legs are extra thick in order to provide superior stability. At the same time, your floors are protected from scratches and damage due to the rubber feet. If you’re a healthcare professional looking to purchase a step stool for your hospital or clinic, this is a solid option which offers great value for your investment. Illness and loss of mobility are the primary culprits when it comes to seniors’ difficulty to reach into higher cabinets, get into a car, enter the bathtub or simply step across the threshold to enter or exit their own house. Even the simplest activities such as getting into and out of bed require extra effort and their quality of life is severely impacted upon. Step stools can provide great relief to people who suffer from stiffness or weak bones and find it hard to perform these everyday essential tasks. Besides allowing them to move around with more ease and retrieve part of their self-sufficiency, mobility aids play an important part in preventing accidents from happening. It’s not seldom that seniors injure themselves when getting out of bed for their nighttime routine when the risk of falling is more likely. Deciding what makes a good bed step stool for elderly citizens can be a cumbersome and time-consuming task, given the importance it will play in the user’s everyday life. Read our advice so that you know which features to look out for. For maximum safety and benefits, it’s important that you pay close attention to the stepping surface. You want to make sure that it provides enough grip to keep the feet stable, which is vital in order to avoid accidents. In the case of some step stools, the platform is made from the same material as the rest of the item. However, there are other models which feature platforms made from different materials, the most common of which is rubber. If you’re purchasing the mobility aid for an elderly person who lives alone, your best bet would be on one equipped with a ribbed rubber platform, which ensures that the friction between its surface and the soles of the feet prevents falls and slips. While rubber is the best option in terms of friction, you can find a decent cheap bed step stool for elderly which sports an aluminum or a textured plastic platform. To provide additional support when stepping onto or off the step stool, some models feature a handrail or a handle. This is usually an upstanding extension of the item’s framework, which is long enough for the user to grip and hold onto for traction. When purchasing a step stool for elderly to get into bed it’s always advisable to invest in one that comes equipped with a handrail, as it will enable the person using it to distribute their weight more efficiently between their lower and their upper body. At the same time, seniors who live alone in their households will have an easier time dragging the footstool around instead of bending to lift it up or pushing it with their legs, which might result in a loss of balance. Depending on where you’re going to use the step stool and for which purposes, you may want to look into other features which could improve the experience of the person using it. For indoor use, you’ll want to choose a model which is equipped with rubber tips for the feet, not only due to the superior anti-slip capabilities but also because this way your floors will be protected against scratches. Conversely, if you’re considering using it outdoors on occasion, you may benefit from a platform which has drain holes so that the moisture is eliminated in case of rainy weather. Another feature you might find useful is the number of steps on a step stool. While it’s possible to find models with several steps, the risk of losing stability and falling increases exponentially. Therefore, it’s best to go for items which feature no more than two steps. If you’re searching for more than a step stool for elderly to get in bed, there are models out there which can just as well serve as fishing chairs or stools that you can sit on while gardening. One aspect to keep in mind when considering the ease of carrying a step stool from one place to another is its weight. As a general rule, you’ll want one which is as lightweight as possible so that is can be easily maneuvered by people with limited mobility. The possibility of folding it into a compact shape is a definite plus if you’re planning on using it in various spaces and environments. Some models also feature a handle for easy transportation. Make sure that the legs can be secured in such a way that they don’t injure the person carrying it.